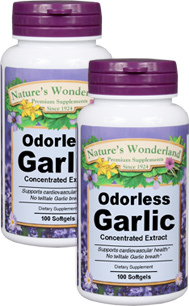 Garlic Extract, Odorless - 25 mg, 100 softgels each (Nature's Wonderland) - Penn Herb Co. Ltd.
Garlic has been used as a culinary spice and medicinal herb for over 5,000 years! It is a natural source of important nutrients that support cardiovascular health and healthy immune function. Get superior support with our concentrated extract in an easy-to-swallow softgel. Our Odorless Garlic is made from whole cloves and aged 18 months. It has been deodorized while maintaining the nutritional value of garlic (contains naturally occurring sulfur compounds, amino acids and trace minerals). Get The Protective Health Benefits Without Garlic Breath! Supports healthy blood pressure; maintains cholesterol levels already within normal range; promotes heart health; circulatory health; immune system support. As a dietary supplement, take 2 softgels 1-2 times daily preferably with meals. SEE PDF LABEL FOR CAUTIONS.